Occasionally, there’s health news about pesticides and their potential ill effects in the human body. Though frequent reminders appear on online and in print about trying to eat organic fruits and vegetables, not much ever filters through about the consumption of wheat. This is somewhat surprising, given that most people in North America consume wheat every day. It could be that we’ve all been lulled into a false sense of security when it comes to eating wheat. Recently, researchers in Stuttgart, Germany, noted that human intake of pesticide residues from consumption of processed food plays an important role in evaluating current agricultural practice. In other words, if no one measures pesticide intake, then the assumption is that widespread spraying of wheat crops with pesticides is fine. The researchers decided to analyze the uptake and translocation of pesticides in wheat after spray application and subsequent intake by people. Based on the evaluation of residues in edible parts of harvested wheat, they predict that between 22.0 milligrams and 2.1 grams per kilogram of applied pesticide are taken in by humans via consumption of processed wheat products. These results were compared with experimentally grown wheat and with estimated intake via inhalation and ingestion caused by indirect emissions, i.e. the amount lost to the environment during pesticide application. The researchers found that there were certain factors that influenced the amount of pesticide residues: the breakdown of pesticide chemicals on the plant; and the time between pesticide application and crop harvest. According to the research team, intake fractions from residues in sprayed wheat were up to four times higher than intake fractions estimated from indirect emissions. This means that exposure of food crops after direct pesticide treatment is something that needs to be monitored closely. 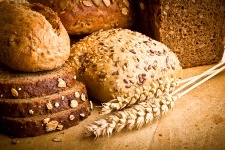 The wheat we eat in our bread and baked goods may be more contaminated with chemicals than we think. On a more positive note, the researchers suggested that food processing may reduce pesticide residues by approximately 63%. However, the more a grain like wheat is processed, the more nutrients it’s likely to lose. It may be time to consider buying products made with organic wheat flour to get the most from this healing food.